The latest construction apps, how to impact the product roadmap, new Connect jobsite improvements, and more. Sometimes your best construction tools don’t involve heavy equipment or fancy gadgets. At Egnyte, we’ve partnered with the best-in-class construction apps to make sure you’re always connected. Read more about how you can build better with apps. Work with the gold standard - connect, store and share your AutoCAD plans with Egnyte for anytime, anywhere collaboration. Always get the full picture with HoloBuilder, a 360º picture platform for teams. Utilize floor plans and 360º pictures managed by Egnyte. State of Egnyte webinars are your chance to hear from our product team on updates and features coming down the pipe. Attend live (digitally) to ask questions or access them at your convenience from our on-demand library. 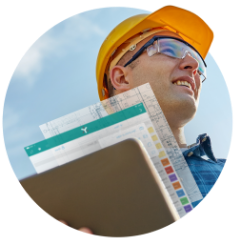 Learn new ways to benefit from Egnyte with this “Blueprint for Success,” a guide on how our most successful construction customers use Egnyte to tackle common construction challenges. Getting 10,000 steps per day is good. 10,000 steps to edit a blueprint… not so good. Streamline your workflow with new features, including PDF document creator, drag and drop email attachments, and our seamless iOS message integration. Most of you use one or more Microsoft products. Now you can classify and monitor your content across Microsoft repositories, including Windows File Servers, Sharepoint, and OneDrive with Egnyte Protect. Post your product idea in the new Egnyte Community so others can kudo (up-vote) the idea and influence our product roadmap. Or check out other ideas to kudo. Can you protect data you can’t see? Learn what you need to know about meeting data governance from this ESG research firm whitepaper. Did you see our CEO, Vineet Jain on Bloomberg? He discussed the state of enterprise content services in 2018 and beyond.